Everlash Adhesive Fast Drying Black 10ml offers strong hold and fastest dry time of 3 to 5 seconds for for One-by-One extensions eyelashes. This fast dry semi-permanent lash extensions adhesive has low fumes and offers flexibible hold. Extensions can hold from 4-6 weeks to the end of the natural lash’s life cycle, up to 90 days, depending on client characteristics and homecare. Everlash Angled Tweezers are specially designed for applying individual lashes. Everlash Semi-Permanent Lash Extensions Adhesive Powerful Black 5ml dries quickly yet maintains flexibility. This powerful One-by-One extension adhesive has low fumes and it produces a very strong bond. Extensions can hold from 4-6 weeks to the end of the natural lash’s life cycle, up to 90 days, depending on client characteristics and homecare. 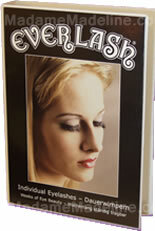 Everlash One by One Individual Eyelashes 12mm are used to create completely custom semi-permanent lash extensions. Everlash One by One Individual Eyelashes 15mm are used to create completely custom semi-permanent lash extensions.